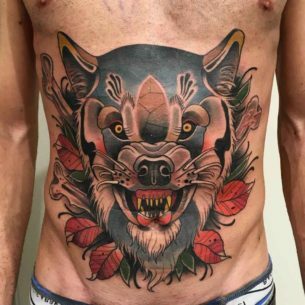 Wolf tattoos are meant for clever, strong-willed, and self-confident people. This animal had always been treated with respect and admiration. 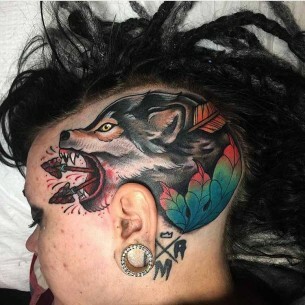 No wonder, the flood of people willing to make one of such tattoos has always been constant for decades and even centuries. These wild born predators are remarkable hunters and had always been one of the main competitors with a human in getting food, therefore associated with cunning, cruelty, and evil. 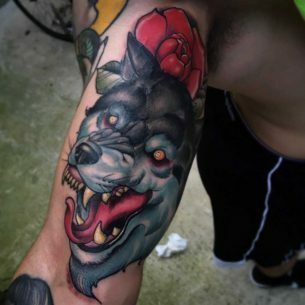 Wolf eyes, shining in the darkness, the habit of hunting prey at night and communicating with the help of howling – all these things served the stereotypical belief that these forest predators are connected with the underworld, evil spirits, and demons. 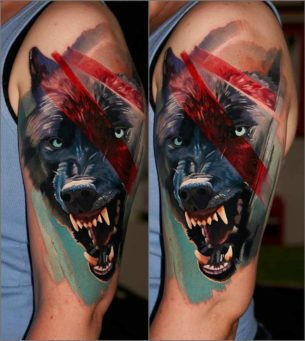 Thus, manhood used to notice wolf’s bravery, strength and sophistication during the hunting. 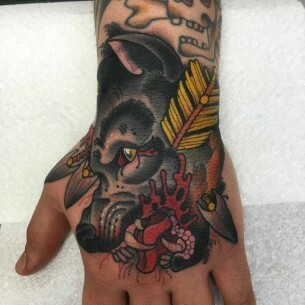 The main interpretation of the symbol is the bravery, courage, loyalty, stamina and freedom. 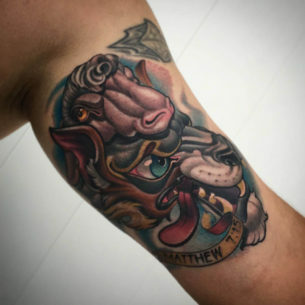 The one who picks this design has to fit all the enumerated traits typical for this animal which means to be independent, strong, loyal to the family and friends, self-confident and follow your ambitions. It does not suit light-minded, shy, slow and weak people. 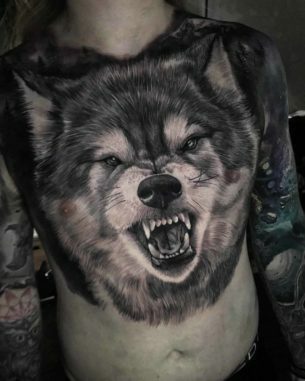 Wolf tattoos are often placed on backs, shoulders or chests. 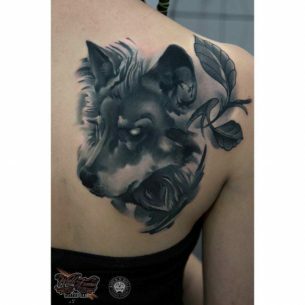 Wolf tattoo ideas created for other placement solutions are quite rare. Black and gray ideas are preferable the most with an accent on the play of light and shadows. 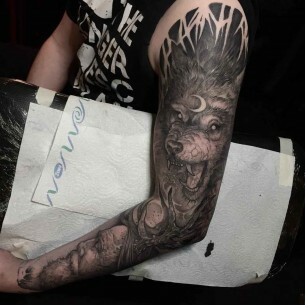 In other cases, the drawing can be a realistic one as well as stylized in all possible ways even to look cartoonish. There are plenty of different ideas , each of them has its own separate meaning. 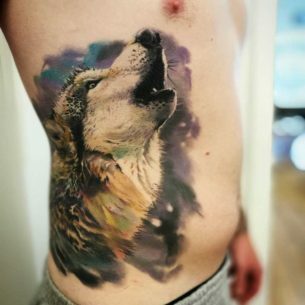 For example, wolf howling at the moon tattoo stands for loneliness and self-sufficiency and sometimes even the betrayal experienced. 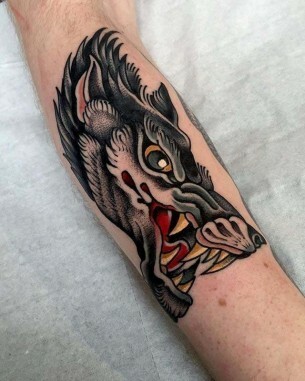 – Grinned wolf or with the mouth opened means aggression, strength, cruelty. 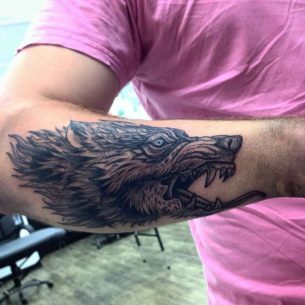 – Running wolf tattoo would mean danger, adrenaline, a need for speed and unreasonable risk, search for traveling and adventures and sometimes even vindictiveness of the tattoo owner. – Animal depicted during the jump means the ability to overcome all possible difficulties to reach the aims of the owner of such body drawing. 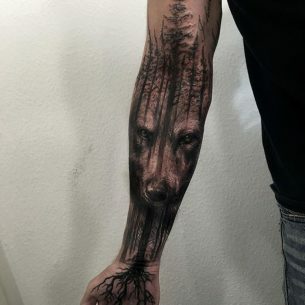 – A werewolf during the transformation or in its animalistic form stands for the dark sides of the personality which an owner of the body drawing wants to comprehend and tame. 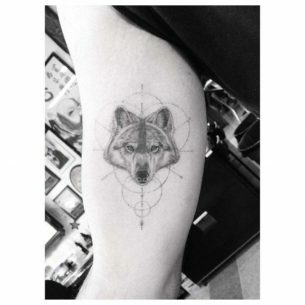 – A she-wolf tattoo, especially with her puppies, is a symbol of loyalty, reliability, care and support. 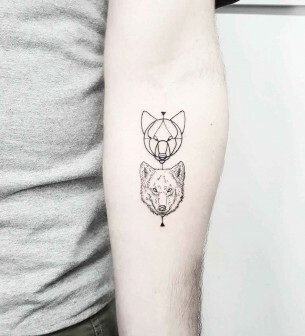 – White wolf tattoo points out the fearless, strong, extraordinary person, – a lonely warrior. – An animal in flames or with red eyes is a witchcraft symbol meaning a werewolf, demon or dark forces in general. 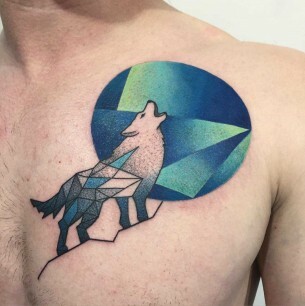 It is better to pick wisely as this symbol is often used as a gangster or prison tattoo idea which can mean something you don’t belong to which can cause a lot of problems in future. 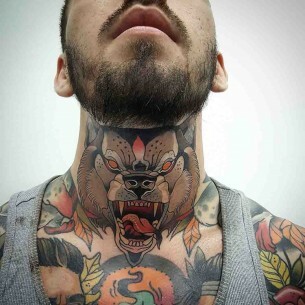 Wolf tattoos are one of the common among all other animalistic symbols. 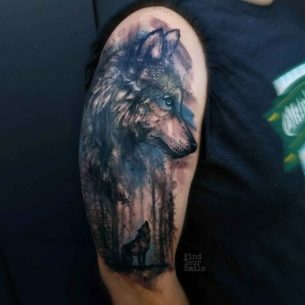 The variety of their meanings depends on what a wolf does in the tattoo. That’s why the designs are really different and beautiful and in spite of their number all of them are unique.